ABI’s Mid-Atlantic Region Endowment Fund Committee played host to a multi-course wine-pairing dinner at Domaine Hudson in Wilmington, Delaware, on November 19. The event featured the wines of Le Cadeau Vineyard in Oregon, and was made possible through generous donations from sponsors Gavin/Solmonese, Polsinelli, Proctor Heyman Enerio LLP and Womble Carlyle Sandridge & Rice, LLP. The dinner served not just as a great night of fine food and good fellowship but also as a successful kickoff to an important part of the calendar for the Anthony H.N. Schnelling Endowment Fund, as many ABI members traditionally consider year-end donations to the fund as well as look ahead to the recognition and reception that will happen at this year’s Winter Leadership Conference (see below). As always, the Endowment Fund is grateful to the generous support of its sponsors and donors, which continue to help the Endowment fund important bankruptcy research and educational activities. Enjoying the November Wine event at Domaine Hudson are (l-r, above) Chris Ward (Polsinelli), his wife Christine, and Shanti Katona (Polsinelli). Sampling some wine (clockwise from left, below) are Nick Verna (Womble Carlyle), Jim Van Horn (McGuireWoods), Derek Abbott, Tom Horan, Matthew Ward, and Frank Monaco (all from Womble Carlyle). Dec. 3–5—Winter Leadership Conference: Give and get noticed at ABI’s Winter Leadership Conference! 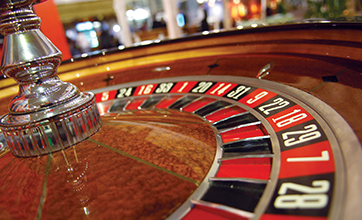 ABI members who pledge or contribute at or above the Sustaining Member level ($2,000 and up) will be recognized at the Friday luncheon and during the Casino Night event on Friday evening. Proceeds from this event benefit the ABI Endowment Fund. Learn more and/or register at abiwlc.org. If you have been considering making a donation to the ABI Anthony H.N. Schnelling Endowment Fund, you may benefit by making your contribution by year’s end. Checks mailed to a charity are considered delivered on the date that you mail them. In addition, you can pay by credit card online at abi.org/endowment/ways-to-give, or call (703) 739-0800 by Dec. 31 for your donation to be considered tax-deductible for 2015. Donors at the Sustaining Member Level ($2,000) and up will be recognized at the ABI Annual Spring Meeting in Washington, D.C., on April 17, 2016 (registration information will be posted at abi.org/events at a later date). For questions about payment options, contact ABI Chief Financial Officer Kathy Sheehan at (703) 739-0800 or ksheehan@abi.org. Thank you for considering a contribution to support the Endowment Fund. The ABI Anthony H.N. Schnelling Endowment Fund helps sponsor the annual Corporate Restructuring Competition, which this year was not only hosted by the University of Pennsylvania’s Wharton School of Business — but won by them! A team from Philadelphia’s Wharton School bested nine other teams from seven schools on November 6. It was the fifth time that a team from Wharton had the honor of placing their name on the Bettina M. White Trophy, presented each year to the winning team. Students were given just a week to solve a hypothetical complex case and present their proposed solutions to judges representing key industry stakeholders. 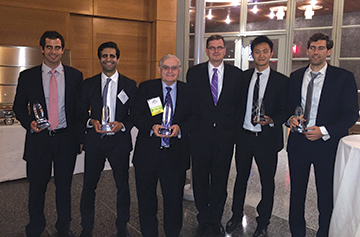 Co-Chairs Stephen Darr of Huron Consulting Group (third from left) and William S. Sugden of Alston & Bird LLP (third from right) are pictured with competition winners Shawn Alt, Mark Saleme, Fei Sun and Jeff Putnam (l-r) of The Wharton School. Other top schools competing this year were Dartmouth College (Tuck), Northwestern University (Kellogg School), Duke University (Fuqua), University of Illinois College of Business, University of Chicago (Booth), University of Virginia (Darden) and defending champion Columbia Business School. Both Wharton and Columbia sent two teams. The team from The University of Virginia Darden School of Business earned second place, while Dartmouth College Tuck School of Business took third. ABI’s Anthony H.N. Schnelling Endowment Fund provided cash prizes of $6,000, $3,500 and $2,500 for the top three teams, respectively.